Here's a torrent for an extremely rare vhs video from Mr Wiseman. It covers the same subjects as his new DVD i.e P.L.A.N, he is being interviewed by an American dude in a studio with cut scenes of John out in the field applying his skills. This was made in 1990 (round about then) and i believe it was a 2 video set (i could be wrong though). I payed £20 for a copy on ebay ages ago, it took me ages to find. Anyway, this has been converted to DVD format hence the large file size (4.02GB). If you have any problems downloading this (lack of seeds) let me know as i have converted my copy onto the harddrive so i can create a torrent if needed. I also have his new dvd but i'm only willing to post torrents of rare, hard to find and out of print stuff. The commercial stuff you can easily find yourself either on the web (legal or ilegal) or in shops, also, the indipendant video makers rely on the income of their DVD's to keep them doing the things we like to watch so if you like any of the DVD's i post then please buy them (links will be provided). 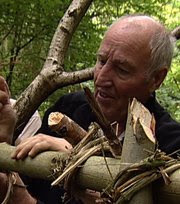 John “Lofty” Wiseman should need little introduction, but for those who are new to survival, it would be difficult to believe that there is a serious survival training specialist in the world today who hasn’t read and learned from John “Lofty” Wiseman’s 'The SAS Survival Handbook'. First published in 1986, translated into 18 different languages and having sold approximately 2 million copies, it is undoubtedly the seminal written work on survival skills. Since the book's release, Lofty's work has shaped the way survival training is done the world over and through it he has taught and inspired many of today's experts who follow in his footsteps. the link is not working can you please create the link and share the same.